WEST LAFAYETTE, Ind. – On a night when receivers broke records, quarterback Tanner Lee had a career outing and Nebraska’s offense had the last laugh in a 25-24 fight with Purdue, kicker Drew Brown might have been one of Nebraska’s most important players. 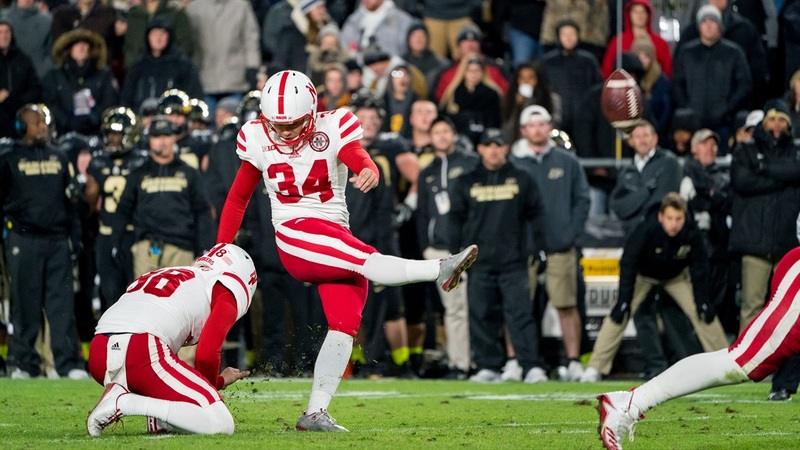 The Huskers called on the senior place kicker four times – the most for Brown in a single game since Sep. 26, 2015 – and he delivered each and every time. The offense didn’t find the end zone until the fourth quarter, but it was Brown’s steady kicking that kept Nebraska within striking distance of the Boilermakers. Brown’s first made kick of the night was a season-long 44-yarder. His last, a 25-yarder that moved him into a tie with his brother, Kris, for the second-most made field goals in Nebraska history. “Thank god for Drew Brown,” head coach Mike Riley said after the game. Brown is now 10-for-12 on the season and a perfect 24-for-24 on extra point attempts. For the second game in a row, Brown also had a highlight play of a tackle. On a kickoff late in the third quarter, Purdue’s D.J. Knox brought the ball 34 yards to the Purdue 43-yard-line before he was up-ended by Brown. As the last line of defense, Brown likely saved a touchdown that would have stretched Purdue’s lead and given the home team all the momentum. “There’s no way I could do what those guys do,” he said. After the game, Brown gave credit to an unlikely person, sophomore punter Isaac Armstrong. Brown’s primary holder all season has been wideout Zack Darlington. However, the junior did not make the trip to Indiana with the rest of the team due to sickness. Midway through the week, Armstrong learned he would be the guy to take over holding duties. Perhaps a snap might have been bungled, or a ball might have been held a smidge off from what Brown was used to and one of his five kicks would have gone awry. In a game with the slimmest of margins for error and an even slimmer margin of victory, the Huskers needed every last one of Brown’s kicks and every last one of Armstrong’s holds.